Home » DK Co. Ltd.
It’s an Extremely Little Rabbit & Bear sticker set! This set includes various "kawaii" elements and useful daily life stickers. Send the sticker to your family and friends! 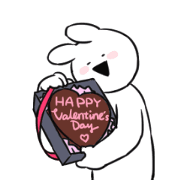 Extremely Rabbit is back with more energy and cute animations, plus some lovely chocolates just in time for Valentine’s. Couples, families, and friends alike—get in on these cute and heartwarming stickers today. Happy Valentine’s Day!